At Gillette's Interstate RV, we sell fun! We carry all the popular styles of RV living, including family-friendly bunkhouses, rear living, rear kitchen, front living, front kitchen, and more. Each layout has its unique benefits and we're proud to sell all the styles that our customers love. We carry hundreds of RVs from all your favorite brands, like Bighorn, Catalina, Designer, Freedom Express, Jay Feather, Mobile Suites, R-Pod, Salem, and so many more. Whether you find the perfect RV waiting for you at our dealership or would like to custom build one using our Custom Build tool, we have what you're looking for! Our large inventory features both New and Pre-owned RVs ready to hit the road! Browse our selection of bunkhouse models that make camping fun again for families. 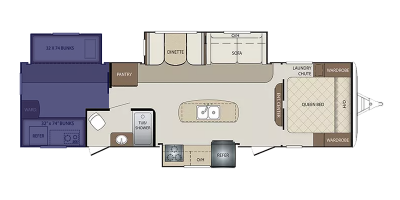 Or tour our fifth wheels that full-time RVers love to call home when on the open road. Are you looking for a versatile toy hauler that will accommodate your ATVs or kayaks? We have plenty of those too! We have the largest selection of name-brand RVs in the country and we offer them at rock-bottom prices! Explore the different floor plan types we carry to decide which one works best for you! Spacious layout options, sometimes with front windshields. Large slide-outs extend to the nearby kitchen for added space. 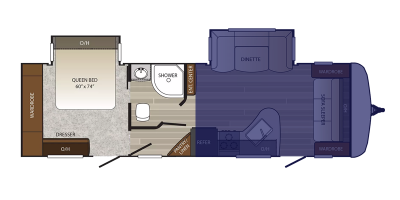 Master bedrooms are typically located in the rear of the RV, for a quieter sleeping experience in back-in campsites. Typically feature large picture windows in the RV’s rear for a lovely view. These tend to have front suites, and sometimes dual entry doors for easy bathroom access. Most have exceptionally large exterior passthrough storage compartments. Perfect for large families. 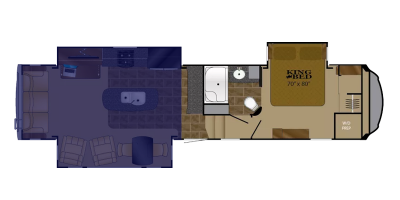 Rear bunkhouse models typically feature large separate rooms, sometimes with additional half baths, and large total sleeping capacities. Models with loft bunks may have outside kitchens for cooking convenience.